A Zala 421-06, a drone that can fly for 90 minutes at 6,500 feet above sea level. Photo by Wikimedia Commons. Small surveillance drones are starting to be part of police departments across America, and the FAA will soon open up the airspace for more to come. This drone invasion has already raised all kinds of privacy concerns. And if you think that’s bad, across the ocean, Russia seems hell-bent on outdoing its former Cold War enemy. Russia’s leading manufacturer of unmanned aerial vehicles, Zala Aero, has provided the Russian government with more than 70 unmanned systems, each containing several aircraft. According to an article published yesterday on Open Democracy Russia, the Kremlin’s romance with drones started in 2006, when the Interior Ministry deployed a Zala 421-04M to monitor street protests at a G8 summit in St. Petersburg. 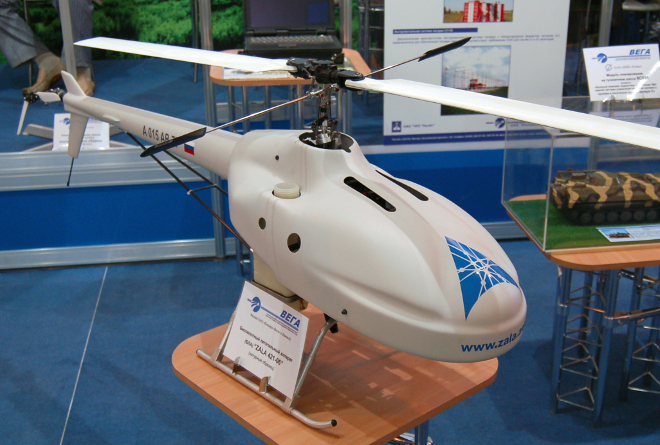 The Russian government has also bought drones from Israel. Vladimir Putin himself is ready to jump on the drone bandwagon. “We need a program for unmanned aircraft. Experts say this is the most important area of development in aviation,” he said in early June. “We need a range of all types, including automated strike aircraft, reconnaissance and other types.” Indeed, Russia is going to allegedly spend around $13 billion on unmanned aerial vehicles through 2020. According to its Zala executive Maksim Shinkevich, almost every Interior Ministry air group has a drone these days. Their favorite one? The Zala 421-08M, a 5.5-pound, 31-inch wingspan unmanned vehicle equipped with a camera that can fly for 90 minutes at almost 12,000 feet. At the right angle, a drone like this can take a quality snapshot of a car’s license plate. What about, say, a protester’s face? “Capturing faces in any detail would however require a very heavy drone with a good camera; more precisely, with a heavy, specialized platform,” Shinkevich told Open Democracy Russia. No matter, these small drones, like the Zala 421-06, are perfect to monitor dissatisfied Russians marching down the streets. “They will be used mainly to maintain public order during local demonstrations and marches, when we shall be keeping watch from the air to avoid any incidents,” said Sergei Kanunnikov, the head of the air operation center in the Department of the Interior of the eastern state of Amur. Drones will also be deployed at the 2014 Winter Olympics in Sochi, a Russian city on the Black Sea. And Sochi won’t be the first Olympic city to secure its skies with robots; London will do the same starting this weekend. Russia’s infatuation with drone technology to monitor and spy popular protests is the Kremlin’s latest attempt to clamp down on civil unrest, both on the streets and online. On Saturday, the Russian government announced a law that requires all NGOs to register as foreign agents, and on July 18, Russia’s upper house of the Parliament passed an Internet censorship bill. With a new fleet of drones, flying robots will be the new Russian spies and in case you’re wondering if the Russians are particularly concerned about privacy, think again. According to Shinkevich, “the secrets of our private lives have become a thing of the past.” And that’s another thing which the two old superpowers can agree on.